A short article on reactions to the Haymarket Affair by the New Zealand labour movement. The Maoriland Worker, the fiery weekly newspaper of the early New Zealand labour movement, devoted much of its issue of 10 November 1911 to commemorating an historic tragedy in the US. That event was the execution in November 1886 of four labour leaders accused of a bomb attack that killed seven police officers in Chicago’s Haymarket Square. The convicted men, including a German-born upholsterer named August Spies, had been active in the campaign for an eight-hour working day. The bomb attack took place at a time of mass strikes and demonstrations, and violent repression by the police. Four unarmed strikers had been shot and killed by Chicago police just the day before the bomb attack, and Spies had called on all workers to arm themselves in retaliation. Yet there was no firm evidence at all to link Spies and his fellow accused to the fatal bombing. They were anarchist scapegoats, and victims of a wave of anti-labour hysteria. Their cases provoked outrage and expressions of support around the world and May 1, the date of an eight-hour-day demonstration that led directly to the Haymarket bombings, became the official annual holiday of the international labour movement. Far-off New Zealand was briefly and curiously invoked during the trial of one of the accused men. August Spies was asked about the explosives he admitted possessing when he printed a revolutionary circular in the office of a leftwing German-language newspaper. Q. How many bombs did you have in the office of the Arbeiter Zeitung? A. I think there were four of these shells that looked like that [indicating], and I think two others. They were iron cast, and given to me by a person, I believe his name was Schwape or Schwoep, who left for New Zealand. Spies said that this man, a shoe-maker from Cleveland, had visited the Arbeiter Zeitung office three years previously and then announced his intention to travel to New Zealand. Unsurprisingly, given the vagueness of the details, New Zealand immigration records of the time cannot confirm his arrival here and in any case the Illinois Supreme Court gave no weight to such an alibi. On November 11 1886, Spies and three fellow defendants were hanged: Albert Parsons, Adolph Fischer and George Engel. A fifth, Louis Lingg, killed himself in prison. The three remaining men were saved by international outrage at this injustice. A new and less vindictive governor of Illinois investigated their case, denounced what had happened and pardoned the three. The four Haymarket Martyrs became icons of the worldwide labour movement. The December 1906 issue of Commonweal, the radical journal of the NZ Socialist Party, noted that the Party’s Wellington branch had recently held a ‘Chicago Martyrs’ commemoration meeting addressed by comrades such as Phillip Joseph, a Russian-born tailor and well-known local anarchist. A visiting speaker from Australia, Dr TF McDonald, ‘also referred to the US Governmental conspiracy which led to the judicial murder of Parsons and his comrades’, before proceeding with his prepared speech on the philosophical inheritance of Kropotkin, Bakunin and others. The Commonweal was edited, in his spare time, by Wellington journalist Robert Hogg, who worked for the national liberal daily, the New Zealand Times. It was probably Hogg who reported in the Times on a meeting of anarchists in Wellington in 1907. The lead speaker said he said known personally some of the comrades of the executed men. 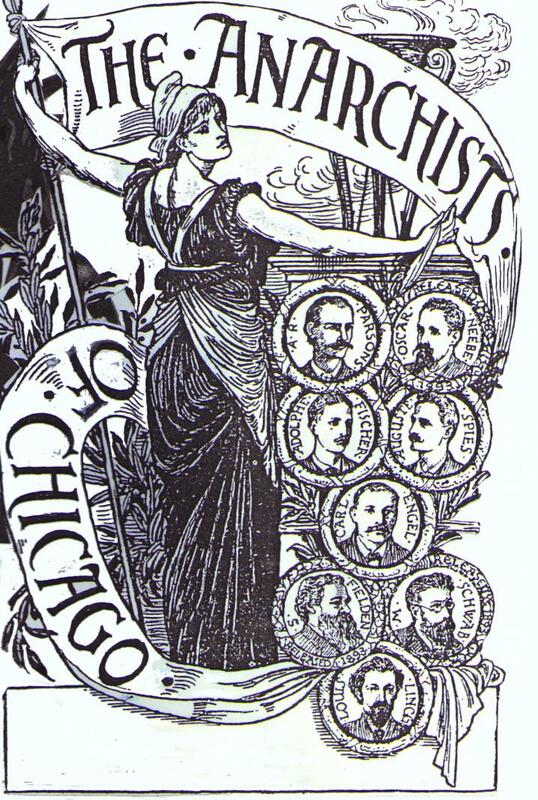 The 1911 issue of the Maoriland Worker quoted above included a glowing review of Frank Harris’s Haymarket-inspired novel The Bomb, portraits of the eight convicted men, a reprint of US socialist leader Eugene Debs’ impassioned memorial oration for them, and a six-column editorial titled ‘The Chicago Martyrs – the men and their message’. The paper made powerfully clear its contempt for the judicial process that had convicted and sentenced the men. ‘We are inclined to agree with the view that the bomb-throwing was the work of a Pinkerton’ [a hired detective]. The principle of the eight-hour working day, one of the key demands behind the May Day demonstrations in the Haymarket, had been adopted in New Zealand ahead of most other countries but could only be put in practice here among some craft unionists. A tiny group of land barons and speculators, the ‘governing families’, controlled the legislature and threw out every Bill intended to guarantee the eight-hour day to all. One politician declared that if it was passed, the Bill would destroy the fabric of society since servants could refuse their masters’ demands to work at any time. From 1890, even though their working hours were still not guaranteed in law, New Zealand workers were granted an annual day’s holiday to celebrate the founding of the eight-hour day. Along with the United States, Australia and Canada, and unlike almost every other country in the world, that holiday is called Labour Day and is not held on 1 May. From as early as 1896, socialists in the labour movement could recognise this as a failure of solidarity. ‘The time has come,’ said one, ‘when New Zealanders should stretch out the hand of comradeship to their brothers across the seas by joining the May Day movement.’ That view, sadly, did not prevail and today New Zealand’s Labour Day is an entirely depoliticised day off work, while May Day goes almost unnoticed. yeah thanks for this, interesting! Great minds think alike Asher!